Do you take fish oil? Are you considering it? Are you weighing the benefits? Or are you confused about how much to take? I’m going to drop some knowledge on you, so hang tight to your seats. According to the American Heart Association, to maintain good health, we need to consume 1,000 mg (also known as 1 gram) of EPA/DHA every day. If you have heart condition or cardiovascular issues, the American Heart Association recommends 3.4 grams of EPA and DHA per day to lower triglyceride levels. Some people say to consume more, but we’ll get to that in a minute. Now here’s the kick – I didn’t say 1,000 mg of fish oil – that’s simply the weight of the capsule. It’s the EPA/DHA contained at the molecular level within the fish oil that is beneficial for us. So How Much EPA/DHA is in My Fish Oil? 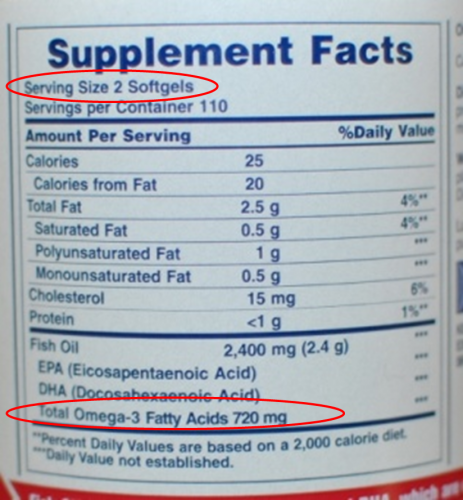 Commercial, off-the-shelf fish oil typically contains 350 mg of EPA/DHA – this is an OK amount. Not overly good, certainly not great. Anything less than 350 is a very poor quality fish oil and should not be purchased – you won’t be getting the most bang for your buck. Most quality fish oil supplements will have about 600 mg of EPA/DHA per capsule. How can you know how much EPA/DHA is in your fish oil? Check the label. In the photo to the right, you can see that two fish oil capsules contain 720 mg – or 360 mg each. You would need to ingest three capsules daily to hit that 1,000 mg mark. Should I Take More Fish Oil? According to Dr. Barry Sears, founder of the Zone Diet, we should ingest a minimum of 4 to 6 grams (4,000 – 6,000 mg) of fish oil per day. He regards “high-dose fish oil” as being between 10 and 20 grams per day. This level will supply between three and six grams of long-chain Omega-3 fatty acids. And Why Do We Need to Consume Fish Oil? “Our typical diets are rich in another type of pro-inflammatory polyunsaturated fatty acid called omega-6. When our dietary intake of omega-6′s far exceeds our intake of omega-3′s, our bodies experience a wide range of negative consequences, all with the underlying cause of increased systemic inflammation. Minimizing dietary intake of omega-6 fatty acids, and supplementing your intake of omega-3 fatty acids, helps to reduce inflammation, and the wide range of downstream effects.